The abhorrent maternal and infant mortality rates in the U.S. were recently discussed at a panel at the 62nd United Nations Council on the Status of Women (UNCSW62). The panel was populated with obstetricians working on measures that hospitals can take to assure the health and well-being of birthing people in their care. Midwives were not even mentioned, much less present on the panel. When I offered that midwives can be the answer to many if not all of these issues, the comments were deflected and ignored. Here we are again, waiting for the experts to think up a plan, while we have had the answer all along. Is it really such a radical idea that midwives take over low risk maternity care? What is the status quo in this country? It is a system with little regard for women's bodies and no respect for their intelligence, a system that doesn’t recognize women's right to self-determination, and is blatantly racist on top of its misogyny. This is the experience of too many people I speak with every day. We must reconsider our intention of becoming part of a system that continues to undermine our power and autonomy, as women, birthing people, and as midwives. It is time to change the status quo. Let’s set the table, let’s invite those who truly want to serve birthing people, let’s find a way to define midwifery in this country that is autonomous, inclusive, respectful, and sacred. Since 1992, the International Confederation of Midwives (ICM) has been celebrating midwives on May 5th. This year’s theme, “Midwives – leading the way with quality care” is an opportunity for midwives around the world to be honored for the work we do to provide quality care for all people we serve. We are leading the way with quality care across the globe, including continuity of care, fewer interventions, multiple postpartum follow-up visits and access to care for rural people. MANA is no longer willing to wait for the self-proclaimed experts to discover what midwives have known throughout the world and throughout history. MANA is no longer willing to sit back and accept the status quo while mothers and babies are dying. As the home for all midwives, MANA claims its voice as an uncompromising advocate for midwives and birthing families. Join us in Maine this fall as we celebrate Community Birth, Community Midwives. Help us bring all midwives together to share knowledge, discuss critical issues, and enjoy our community. 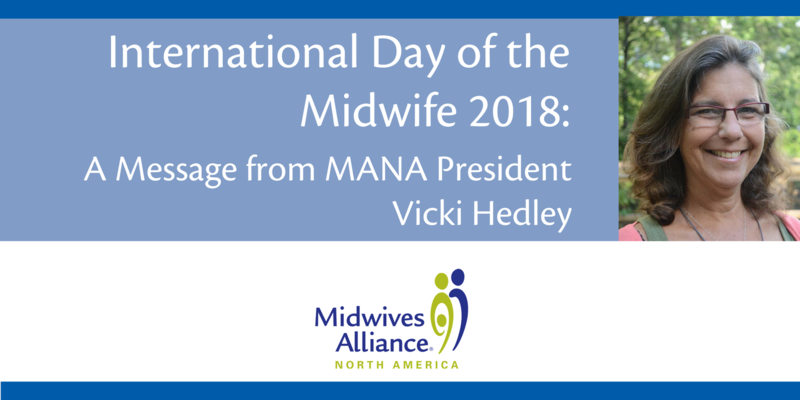 Today on International Day of the Midwife, support community birth and the community of midwives with a generous gift to the MANA Conference Scholarship Fund. MANA honors all midwives today, International Day of the Midwife, and every day!